This document specifies an ASCII CSV text file format that can contain all of the information (metadata and data) that can be found in a NetCDF .nc file that contains a CSV-file-like table of data. The file extension for an ASCII CSV text file following this specification must be .csv so that it can be read easily and correctly into spreadsheet programs like Excel and Google Sheets. Bob Simons will write software to convert an NCCSV file into a NetCDF-3 (and perhaps also a NetCDF-4) .nc file, and the reverse, with no loss of information. Bob Simons has modified ERDDAP to support reading and writing this type of file. NCCSV files have values on a line separated by commas. Spreadsheets have values on a line in adjacent cells. Strings in NCCSV files are often surrounded by double quotes. Strings in spreadsheets are never surrounded by double quotes. Internal double quotes ( " ) in Strings in NCCSV files appear as 2 double quotes. Internal double quotes in spreadsheets appear as 1 double quote. See the Spreadsheet section below for more information. Streamable - Like CSV files in general, NCCSV files are streamable. Thus, if an NCSV is generated on-the-fly by a data server such as ERDDAP, the server can start to stream data to the requester before all of the data has been gathered. This is a useful and desireable feature. NetCDF files, by contrast, are not streamable. The files must contain all of the data and metadata that would be in a tabular NetCDF file, including specific data types. The files must be able to be read into and then written out of a spreadsheet with no loss of information. The files must be easy for humans to create, edit, read, and understand. The files must be able to be unambiguously parsed by computer programs. If some requirement in this document seems odd or picky, it is probably needed to meet one of these requirements. https://www.unidata.ucar.edu/software/netcdf/ . These libraries cannot read NCCSV files, but they can read .nc files created from NCCSV files. Notation - In this specification, brackets, [ ], denote optional items. 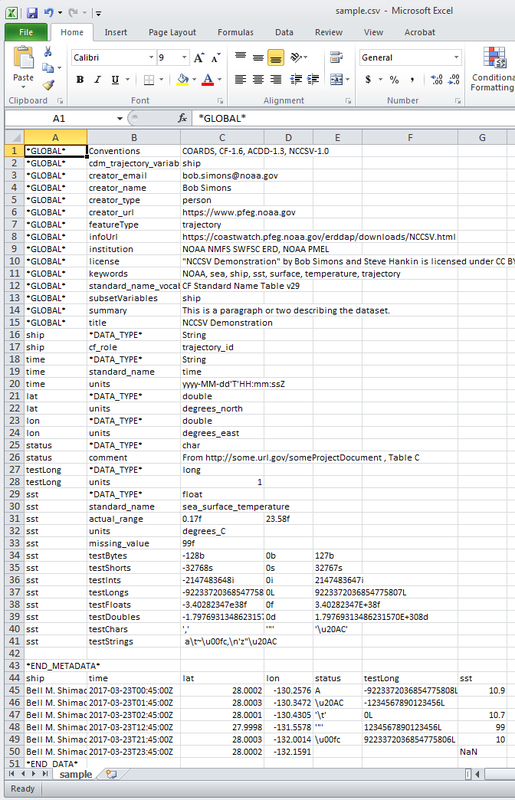 A complete NCCSV file consists of two sections: the metadata section, followed by the data section. NCCSV files must contain only 7-bit ASCII characters. Because of this, the character set or encoding used to write and read the file may be any character set or encoding which is compatible with the 7-bit ASCII character set, e.g., ISO-8859-1. ERDDAP reads and writes NCCSV files with the ISO-8859-1 charset. NCCSV files may use either newline (\n) (which is common on Linux and Mac OS X computers) or carriageReturn plus newline (\r\n) (which is common on Windows computers) as end-of-line markers, but not both. .nccsvMetadata - When both the creator and the reader are expecting it, it is also possible and sometimes useful to make a variant of an NCCSV file which contains just the metadata section (including the *END_METADATA* line). The result provides a complete description of the file's attributes, variable names, and data types, thus serving the same purpose as the .das plus .dds responses from an OPeNDAP server. ERDDAP will return this variation if you request fileType=.nccsvMetadata from an ERDDAP dataset. Spaces before or after items are not allowed because they cause problems when importing the file into spreadsheet programs. One of the conventions listed must be NCCSV-1.0, which refers to the current version of this specification. It is recommended but not required that all of the attributes for a given variable appear on adjacent lines of the metadata section. If an NCCSV file is converted into a NetCDF file, the order that the variableNames first appear in the metadata section will be the order of the variables in the NetCDF file. Optional blank lines are allowed in the metadata section after the required first line with *GLOBAL* Conventions information (see below) and before the required last line with *END_METADATA*. If a spreadsheet is created from an NCCSV file, the metadata data section will appear with variable names in column A, attribute names in column B, and values in column C.
If a spreadsheet following these conventions is saved as a CSV file, there will often be extra commas at the end of the lines in the metadata section. The software that converts NCCSV files into .nc files will ignore the extra commas. variableName is the case-sensitive name of a variable in the data file. All variable names must begin with a 7-bit ASCII letter or underscore and be composed of 7-bit ASCII letters, underscores, and 7-bit ASCII digits. The special variableName *GLOBAL* is used to denote global metadata. attributeName is the case-sensitive name of an attribute associated with a variable or *GLOBAL*. All attribute names must begin with a 7-bit ASCII letter or underscore and be composed of 7-bit ASCII letters, underscores, and 7-bit ASCII digits. *SCALAR* - The special attributeName *SCALAR* can be used to create a scalar data variable and define its value. The data type of the *SCALAR* defines the data type for the variable, so do not specify a *DATA_TYPE* attribute for scalar variables. Note that there must not be data for the scalar variable in the Data Section of the NCCSV file. When a scalar data variable is read into ERDDAP, the scalar value is converted into a column in the data table with the same value on every row. If there are multiple String values, use a single String with \n (newline) characters separating the substrings. byte attribute values (8-bit, signed) must be written with the suffix 'b', e.g., -7b, 0b, 7b . The range of valid byte values is -128 to 127. A number that looks like a byte but is invalid (e.g., 128b) will generate an error message. short attribute values (16-bit, signed) must be written with the suffix 's', e.g., -30000s, 0s, 30000s. The range of valid short values is -32768 to 32767. A number that looks like a short but is invalid (e.g., 21768s) will generate an error message. int attribute values (32-bit, signed) must be written as JSON ints without a decimal point or exponent, but with the suffix 'i', e.g., -12067978i, 0i, 12067978i. The range of valid int values is -2147483648 to 2147483647. A number that looks like an int but is invalid (e.g., 2147483648i) will generate an error message. long attribute values (64-bit, signed, currently supported by NUG and ERDDAP but not yet supported by CF) must be written without a decimal point and with the suffix 'L', e.g., -12345678987654321L, 0L, 12345678987654321L . If you use the converting software to convert an NCCSV file with long values into a NetCDF-3 file, any long values will be converted to double values. The range of valid long values is -9223372036854775808 to 9223372036854775807. A number that looks like a long but is invalid (e.g., 9223372036854775808L) will generate an error message. float attribute values (32-bit) must be written with the suffix 'f' and may have a decimal point and/or an exponent, e.g., 0f, 1f, 12.34f, 1e12f, 1.23e+12f, 1.23e12f, 1.87E-7f. Use NaNf for a float NaN (missing) value. The range of floats is approximately +/-3.40282347E+38f (~7 significant decimal digits). A number that looks like a float but is invalid (e.g., 1.0e39f) will generate an error message. double attribute values (64-bit) must be written with the suffix 'd' and may have a decimal point and/or an exponent, e.g., 0d, 1d, 12.34d, 1e12d, 1.23e+12d, 1.23e12d, 1.87E-7d. Use NaNd for a double NaN (missing) value. The range of doubles is approximately +/-1.79769313486231570E+308d (~15 significant decimal digits). A number that looks like a double but is invalid (e.g., 1.0e309d) will generate an error message. String attribute values are a sequence of UCS-2 characters (i.e., 2-byte Unicode characters, as in Java), which must be written as 7-bit ASCII, JSON-like strings so that non-ASCII characters can be specified. Double quotes (") must be encoded as two double quotes (""). That's what spreadsheet programs require when reading .csv files. That's what spreadsheet programs write when you save a spreadsheet as a .csv file. The special JSON backslash-encoded characters must be encoded as in JSON (notably \n (newline), but also \\ (backslash), \f (formfeed), \t (tab), \r (carriage return) or with the \uhhhh syntax. In a spreadsheet, don't use Alt Enter to specify a new line within a text cell; instead, use \n (2 characters: backslash and 'n') to indicate a new line. \uhhhh - All characters less than character #32 or greater than character #126, and not otherwise encoded, must be encoded with the syntax \uhhhh, where hhhh is the 4-digit hexadecimal number of the character, e.g., the Euro sign is \u20AC. See the code pages referenced at https://en.wikipedia.org/wiki/Unicode to find the hexadecimal numbers associated with specific Unicode characters, or use a software library. If the String has a space at the beginning or end, or includes " (double quote) or a comma, or contains values that would otherwise be interpreted as some other data type (e.g., an int), or is the word "null", the entire String must be enclosed in double quotes; otherwise, unlike JSON, the enclosing double quotes are optional. We recommend: when in doubt, enclose the entire String in double quotes. Spaces at the beginning or end of a String are strongly discouraged. For now, the use of characters greater than #255 is discouraged. NCCSV supports them. ERDDAP supports them internally. Some output file types support them (e.g., .json and .nccsv). But many output file types don't support them. For example, NetCDF-3 files do not support such characters because NetCDF files use 1-byte characters and CF currently does not have a system for specifying how Unicode characters are encoded in NetCDF Strings (e.g., UTF-8). This will probably improve over time. char attribute values are a single UCS-2 character (i.e., 2-byte Unicode characters, as in Java), which must be written as 7-bit ASCII, JSON-like characters so that other characters can be specified (see the String definition above for encoding of special characters, with the addition of encoding a single quote as \'). Char attribute values must be enclosed in single quotes (the inner quotes) and double quotes (the outer quotes), e.g., "'a'", "'""'" (a double quote character), "'\''" (a single quote character), "'\t'" (a tab), "'\u20AC'" (a Euro character). This system of using single and double quotes is odd and cumbersome, but it is a way to distinguish char values from Strings in a way that works with spreadsheets. A value that looks like a char but is invalid will generate an error message. As with Strings, the use of characters greater than #255 is currently discouraged. Suffix - Note that in the attributes section of an NCCSV file, all numeric attribute values must have a suffix letter (e.g., 'b') to identify the numeric data type (e.g., byte). But in the data section of an NCCSV file, numeric data values must never have these suffix letters (with the exception of 'L' for long integers) -- the data type is specified by the *DATA_TYPE* attribute for the variable. WARNING: Specifying the correct *DATA_TYPE* is your responsibility. Specifying the wrong data type (e.g., int when you should have specified float) will not generate an error message and may cause information to be lost (e.g., float values will be rounded to ints) when the NCCSV file is read by ERDDAP or converted into a NetCDF file. char Discouraged - The use of char data values is discouraged because they are not widely supported in other file types. char values may be written in the data section as single characters or as Strings (notably, if you need to write a special character). If a String is found, the first character of the String will be used as the char's value. Zero length Strings and missing values will be converted to character \uFFFF. Note that NetCDF files only support single byte chars, so any chars greater than char #255 will be converted to '?' when writing NetCDF files. Unless a charset attribute is used to specify a different charset for a char variable, the ISO-8859-1 charset will be used. long Discouraged - Although many file types (e.g., NetCDF-4 and json) and ERDDAP support long data values, the use of long data values in NCCSV files is currently discouraged because they are currently not supported by Excel, CF and NetCDF-3 files. If you want to specify long data values in an NCCSV file (or in the corresponding Excel spreadsheet), you must use the suffix 'L' so that Excel doesn't treat the numbers as floating point numbers with lower precision. Currently, if an NCCSV files is converted into a NetCDF-3 .nc file, long data values will be converted into double values, causing a loss of precision for very large values (less than -2^53 or greater than 2^53). It is fine to include additional attributes which are not from the CF or ACDD standards or from ERDDAP. The first line of the data section must have a case-sensitive, comma-separated list of variable names. All of the variables in this list must be described in the metadata section, and vice versa (other than *GLOBAL* attributes and *SCALAR* variables). The second through the penultimate lines of the data section must have a comma-separated list of values. Each row of data must have the same number of values as the comma-separated list of variable names. Spaces before or after values are not allowed because they cause problems when importing the file into spreadsheet programs. Each column in this section must contain only values of the *DATA_TYPE* specified for that variable by the *DATA_TYPE* attribute for that variable. Unlike in the attributes section, numeric values in the data section must not have suffix letters to denote the data type. Unlike in the attributes section, char values in the data section may omit the enclosing single quotes if they are not needed for disambiguation (thus, ',' and '\'' must be quoted as shown here). There may be any number of these data rows in an NCCSV file, but currently ERDDAP can only read NCCSV files with up to about 2 billion rows. In general, it is recommended that you split large datasets into multiple NCCSV data files with fewer than 1 million rows each. If there is additional content in the NCCSV file after the *END_DATA* line, it will be ignored when the NCCSV file is converted into an .nc file. Such content is therefore discouraged. In a spreadsheet following these conventions, the variable names and data values will be in multiple columns. See the example below. This is the recommended way to handle missing values for byte, short, int, and long variables. For float and double variables, an empty field will be converted to NaN. DateTime values (including date values that don't have a time component) may be represented as numbers or as Strings in NCCSV files. A given dateTime variable may only have String values or only numeric values, not both. The NCCSV software will convert String dateTime values into numeric dateTime values when creating .nc files (as required by CF). String dateTime values have the advantage of being easily readable by humans. All dateTime values for a given data variable must use the same format. yyyy-MM-dd'T'HH:mm:ss.SSSZ - which is the ISO 8601:2004(E) dateTime format. You may need a shortened version of this, e.g., yyyy-MM-dd'T'HH:mm:ssZ (the only recommended format) or yyyy-MM-dd. If you are changing the format of your dateTime values, NCCSV strongly recommends that you change to this format (perhaps shortened). This is the format that ERDDAP will use when it writes NCCSV files. yyyyMMddHHmmss.SSS - which is the compact version of the ISO 8601:2004 dateTime format. You may need a shortened version of this, e.g., yyyyMMdd. M/d/yyyy H:mm:ss.SSS - which handles US-style dates and dateTimes like "3/23/2017 16:22:03.000". You may need a shortened version of this, e.g., M/d/yyyy . yyyyDDDHHmmssSSS - which is the year plus the zero-padded day of the year (e.g, 001 = Jan 1, 365 = Dec 31 in a non-leap year; this is sometimes erroneously called the Julian date). You may need a shortened version of this, e.g., yyyyDDD . As required by CF, all degree values (e.g., for longitude and latitude) must be specified as decimal-degree double values, not as a degree°min'sec" String or as separate variables for degrees, minutes, seconds. The direction designators N, S, E, and W are not allowed. Use negative values for West longitudes and for South latitudes. This is optional for CF, but required in NCCSV. *GLOBAL*,institution,"NOAA NMFS SWFSC ERD, NOAA PMEL"
licensed under CC BY 4.0, https://creativecommons.org/licenses/by/4.0/ ." *GLOBAL*,keywords,"NOAA, sea, ship, sst, surface, temperature, trajectory"
*GLOBAL*,summary,"This is a paragraph or two describing the dataset." status,comment,"From http://some.url.gov/someProjectDocument , Table C"
This sample file includes many difficult cases (e.g., char and long variables and difficult String values). Most NCCSV files will be much simpler. The license line is broken into two lines here, but is just one line in the sample file. \u20AC is the encoding of the Euro character and \u00FC is the encoding of ü. It would be clearer and better if the units attribute for the testLong variable were written in double quotes indicating it is a String value. But the current representation (1, without quotes) will be interpreted correctly as a String, not an integer, because there is no 'i' suffix. Unlike other numeric data types, the long values in the data section have the suffix ('L') that identifies their numeric data type. This is required to prevent spreadsheets from interpreting the values as floating point numbers and thus losing precision. Write numeric attribute values as specified for NCCSV files (e.g., with a suffix letter, e.g., 'f', to identify attribute's data type). In Strings, write all characters less than ASCII character #32 or greater than character #126 as either a JSON-like backslashed character (e.g., \n for newline) or as the hexadecimal Unicode character number (case insensitive) with the syntax \uhhhh (e.g., \u20AC for the Euro sign). Use \n (2 characters: backslash and 'n') to indicate a new line, not Alt Enter. If a spreadsheet following these conventions is saved as a CSV file, there will often be extra commas at the end of many of the lines. The software that converts NCCSV files into .nc files will ignore the extra commas. Choose File : Open . Change the file type to Text Files (*.prn; *.txt; *.csv) . Search the directories and click on the NCCSV .csv file. Choose File : Save As . Change the Save as type: to be CSV (Comma delimited) (*.csv) . In response to the compatibility warning, click Yes . The resulting .csv file will have extra commas at the end of all the rows other than the CSV rows. You can ignore them. Choose to Upload a file and click on Upload a file from your computer . Select the file, then click Open . Or, choose My Drive and change the file type drop down selection to All file types . Select the file, then click Open . The resulting .csv file will have extra commas at the end of all the rows other than the CSV rows. Ignore them. If you create an NCCSV file with a text editor or if you create an analogous spreadsheet in a spreadsheet program, the text editor or the spreadsheet program will not check that you followed these conventions correctly. It is up to you to follow these conventions correctly. The conversion of a spreadsheet following this convention into a csv file (thus, a NCCSV file) will lead to extra commas at the end of all the rows other than the CSV data rows. Ignore them. The software the converts NCCSV files into .nc files will ignore them. If an NCCSV file has excess commas at the end of rows, you can remove them by converting the NCCSV file into a NetCDF file and then converting the NetCDF file back into a NCCSV file. Print the contents of the .nc file with ncdump (http://www.unidata.ucar.edu/software/netcdf//old_docs/docs_4_1/netcdf/ncdump.html ). View the contents of the data in ERDDAP.